Pours a light amber hue with a pillowy frothy off-white head with excellent retention. Lacing is almost non-existent. Brilliant clarity. Body has settled a slightly darker shade of amber and is relatively still. As the head has had a chance to settle, sticky rings of lacing now cling to the glass in its wake. Immediately the nose perks up with hop goodness. 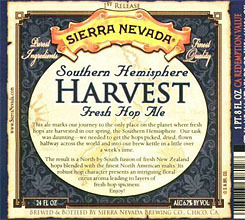 The moderately strength hop aroma consists of floral and slightly grassy notes. After a bit of time, a floral - rose presence takes over the glass. A doughy malt presence is detected, but does not dominate. Initial taste provides an unexpected creamy texture that carries some sweet caramel malts that play in harmony with a subtle hop character, but moving towards the finish, the strength of the hops moves to the front and gives a stronger bitterness, although still not completely dominating the malts. Balanced throughout, just slightly shifted from malt to hops from front to back. Softly carbonated, the creamy body coats the mouth with a thin oily film. Although it medium in body, it is not difficult to drink. A soft alcohol presence was noted, but was overpowerd by the amazing citris-grapefruit finish. The creaminess is a nice surprise. It was unexpected, but welcomed with open arms. The hop presence is not harsh, which increases the drinkability.